Little Shop Of Horrors has a history of featuring some great character actors. A young unknown Jack Nicholson starred in the original 1960 B movie while Rick Moranis and the-then little known Steve Martin were in the 1986 musical film. With this new touring production, it now seems time for another newcomer to make their mark - former X Factor contestant Rhydian. 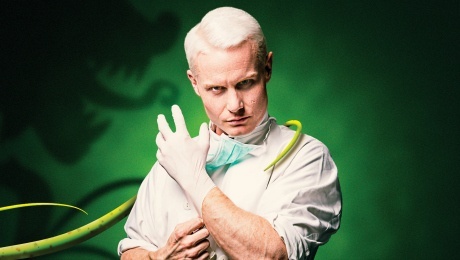 While Rhydian has gained popularity for his opera singing, he really comes into his own as the sadistic dentist Orin Scrivello, plus other crazy parts. His eccentricities and lively personality make Rhydian a perfect casting choice in this tongue-in-cheek, vivacious musical. Plus his voice is tremendous. I caught the show during its tour at Birmingham's New Alexandra Theatre, where it stays from September 27 to October 1 before heading on to cities including Cheltenham, Coventry, Manchester and Glasgow until November 26. Little Shop of Horrors follows Seymour Krelborn, the assistant at Mushnik's Flower Shop in downtrodden Skid Row, who becomes an overnight sensation when he discovers a strange and exotic plant that he names Audrey Two. As the plant grows bigger, he catches the attentions of his glamorous colleague Audrey, making Seymour give in to the plant's blood-thirsty nature with dire consequences. Director Tara Louis Wilkinson, behind this new production, said she wanted to bring out the Motown feel of the songs by setting it in the late 1950's. It helps that the chorus of Chiffon, Crystal and Ronette sound and look like The Supremes (the wonderfully sassy Vanessa Fisher, Sasha Latoya and Cassie Clare respectively). Wilkinson has also stayed true to the intentions of the original Little Shop of Horrors B-movie that was supposed to be a satire of the dubious sci-fi movies of the 1950s. She has hit the nail on the head with the comedy that helped make this such a cult classic. 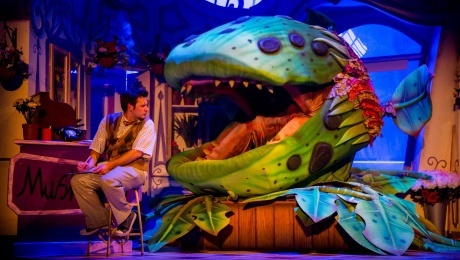 There's a fun, bright, lavish set that feels like no attention to detail has been spared, while the Audrey2 plant is well represented through puppets and electronics that bring plenty of laughs. While Rhydian surprises as a newcomer, the main leads of Seymour, Audrey and Mushnik are played by stage veterans who give faultless performances. Sam Lupton as Seymour and Stephanie Clift as Audrey have a lovely rapport while Paul Kissaun (once a member of the Flying Pickets) is suitably loathsome as Mushnik. It's other bonus is that it has a lively, catchy soundtrack. The music was written by legendary songwriter Alan Menken in his early days, who went on to create numerous Walt Disney film scores. This is another success for Sell a Door Theatre Company, which has previously toured critically acclaimed productions of Avenue Q, The History Boys and Seussical the Musical. 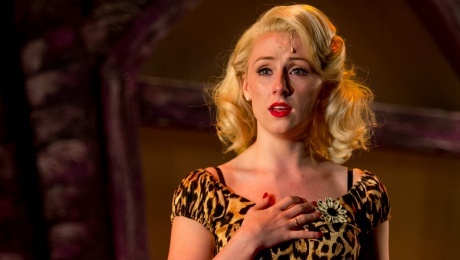 Fun, memorable and glowing with vivacity, this new production of musical cult classic Little Shop Of Horrors does not disappoint. Tickets cost from £17.90 - £43.40 from the New Alexandra Theatre website. 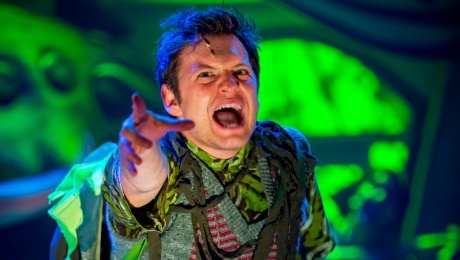 For other UK tour dates visit the Little Shop of Horrors tour website.